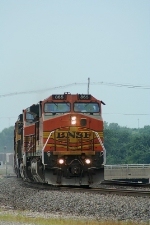 Description: BNSF 865 East rolls over the top of the recently closed to traffic Hewitt Ave bridge. You can tell by the dents and missing paint on the bridge that it got clobbered by too tall trucks often. Title: Looking down the side. 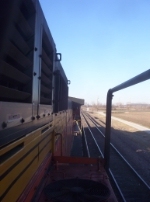 Description: Looking down the right side of the BNSF 865 towards Dupo. Description: Gruesome looking trio coming into yard. Description: Two ex-ATSF units lead this train West past Union Jct.